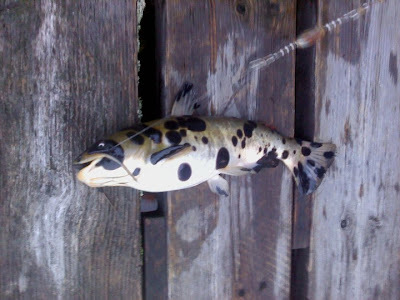 The Maine Outdoorsman: East Grand Hornpout with Black Spot Disease? A friend sent me this picture of a Hornpout Caught in East Grand with a possible case of Melanosis or Black Spot Disease? Any other Jr. Biologists/Viral Disease Experts in my readership whom would care to take a guess? All I want to know is how he managed to get it off the hook?!?! My vote would have been to cut the line, spear it with a LONG stick and chuck it into the nearest garbage can. I don't know but if it were me I would want to be wearing nothing less than a full bio-hazard suit..nah-sty! PB, At least it isn't as bad a two years ago when I opened up a Black Bear for a client and it was FILLED with pencil sized worms. I almost VURPED.